A few weeks prior to its grand reopening, the freshly restored Championship Course at Tanglewood Park in Clemmons survived its first big test. Hurricane Florence dumped about five inches of rain on the Triad in two days. The Championship Course’s highly anticipated reopening is now slated for mid to late October, according to Wilcox. He said the ribbon cutting was a couple of weeks behind schedule due to Florence and other weather-related issues. Tanglewood’s bunkers were rebuilt using the “Better Billy Bunker System” popularized during Billy Fuller’s tenure as golf course superintendent at Augusta National Golf Club, home of The Masters. Originally known as the Enhanced Bunker Drainage Method, the primary purpose behind this specification was to minimize sand erosion and contamination from native soils during heavy rainstorms. The chief features of Better Billy bunkers are a two-inch gravel layer applied over the bunker floor and herringbone tile system capped with a geo-textile liner. 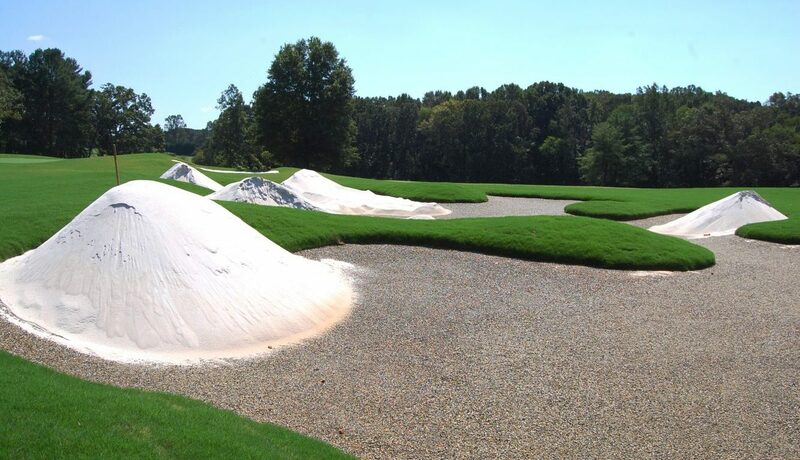 The gravel serves as a conduit for water to transfer down the bunker floor slopes into the tile pipe system, greatly reducing if not eliminating sand movement. The liner secures the gravel blanket and prevents native soils underneath from contaminating the preferred bunker sand that was installed overtop the liner. This method also consistently reduces manpower requirements in bunkers following rainstorms by 80 percent or more. In addition, the restoration work eliminated a number of the Championship Course’s 99 bunkers that were superfluous, reducing the total to 78 — a reduction of nearly 50 percent in square footage. “It’s going to be fantastic,” Wilcox said. “We’ll have new bunkers and new greens on a golf course that is such a great layout anyway. The green complexes are so good here; they’re so unique. It’s going to enhance the entire Tanglewood experience. The Championship Course’s Wall of Fame through the years is an impressive; A Who’s Who of some of history’s greatest golfers. Lee Trevino captured the PGA Championship at Tanglewood in 1974, holding off Jack Nicklaus and 62-year-old Sam Snead. Trevino also captured the Vantage Championship — the PGA Tour’s first million-dollar purse — on the Championship Course. Hale Irwin won a pair of Vantage Championships, while other winners included Gary Player, Larry Nelson, Jim Colbert and Al Geiberger. The Vantage Championship was contested at Tanglewood from 1987-2002. The tournament was supposed to end in 2001, but it was cancelled that year when it fell on the same week as 9/11. Tournament sponsor RJR said it was not going to allow such a prestigious event to end in such a tragic manner. Billy Mayfair also won the USGA’s U.S. Amateur Public Links at Tanglewood in 1986. Scott Hoch captured the North Carolina Amateur there in 1976, while Lanny Wadkins was medalist in a 1971 PGA Tour Regional Qualifier at Tanglewood. “We’ve had some really nice events here,” said Wilcox, who has been at Tanglewood since 1990. Wadsworth Golf Construction Co. of Plainfield, Ill., was awarded a $2.4 million contract for the Tanglewood work— the first of four payouts from a $15 million bond referendum for Forsyth County Parks and Recreation approved by voters in November 2016. The money for the parks and recreation work is part of a $430 million total bond package. Tanglewood’s other two courses – The Reynolds and the Par 3 – have remained open while work was performed on the Championship Course. Pinehurst architect Richard Mandell, who oversaw the Championship Course project, is currently creating a master plan for the Reynolds Course, along with the Par-3 Course and adjoining driving range. Before work began, as he does on all his projects, Mandell headed a series of four complete course walk-throughs with Wilcox and superintendent Lee Barefoot, as well as other regular golfers and staff. Their input led to numerous subtle touches such as the removal of several bunkers behind green complexes, easing the approach shot demands.